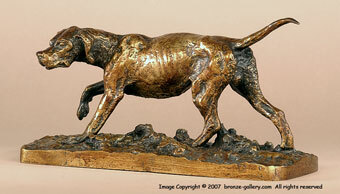 Hunting dogs were one of the most popular subjects done by the Animaliers. These working dogs were portrayed doing their jobs of pointing birds and retrieving shot birds. 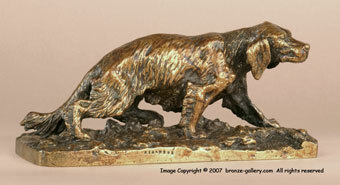 Fratin sculpted this Setter and Pointer as a pair, they are both on point after game birds. The Setter is 4 3/8" tall by 9 3/4" long (11.5cm by 25cm), and the Pointer is 4 3/4" tall by 9 3/8" long (12cm by 24cm), they are finished in a light brown and copper gilt patina. Each dog is signed and shows Fratin's characteristic shaggy texture in the fur coats of both dogs.